Find it hard to wake up in the morning? This is mainly due to biological clock as well as other factors. 10 tested & effective ways may help you deal with it. Many people enjoy staying late in bed at the weekend. However, some of us also wish this could happen during the workdays too! Getting out of bed is a real problem for some people and may interfere with their daily life. However, don't think this is because they are lazy or stay up late. Scientists have now pinpointed why certain people have difficulty falling asleep at night and can't wake up in the next morning – it has all to do with the internal body clock, but you can do many things to help. Can't Wake Up in the Morning, Why? Sleep inertia is when you feel groggy and not completely awake when the alarm clock goes off. In this state, it's often tricky to perform even easy tasks, as part of your body is still asleep. This is very common; most people who use alarm clocks have difficulty waking up. Sleep inertia can be due to suddenly waking up from rapid eye movement sleep (REM sleep or deep sleep), and a chemical called melatonin is produce, making you sleepy. With time going by, higher levels of melatonin are produced during REM. Conversely, non-REM sleep has a slow-down brain activity, heart rate, and blood pressure, which makes you to wake up much faster. During adolescence, the body undergoes various changes, including the internal body clock. Puberty breaks down around 1 in 3 neuronal synaptic connections, which need to be rebuilt. Most adolescents need around 9 and a half hours' sleep to create memories and work effectively. Young people also prefer to go to bed later than others, often around 1-2 a.m. or later, making them can't wake up in the morning. Sleepwalking and night terrors can occur during deep sleep, which can be so profound that it's almost a natural coma. Teenagers suffer from this more than older adults. It's very difficult to wake someone during deep sleep, and the closed ones may have to deal with dangerous situations. Teenagers who suffer from attention deficit hyperactivity disorder (ADHD) naturally sleep for longer than others, typically 12-14 hours per day. Sometimes ADHD patients are found to score highly on daytime sleepiness tests, although the reasons for this are unknown. Narcolepsy can also make wake up in the morning hard for you. The classic symptoms are sudden hallucinations and falls to the ground, but many narcoleptic patients don't exhibit these signs. However, they do find it incredibly difficult to wake up, due to their lack of the stimulating neurotransmitter hypocretin-orexin. In addition, people who find themselves can't get up in the morning may naturally need lots of sleep, much more than the typical 7-8 hours a night. Others may have sleep apnea, where it is difficult to wake up, no matter how much sleep you've had. Finally, many people suffer from common sleep ailments such as insomnia and restless legs. Can't Wake Up in the Morning, What Can I Do? Jump out of bed. Yes, you can do this! Jump out of bed with plenty of enthusiasm, stretch your limbs, and promise to tackle the day. Position your alarm far from the bed. It's all too easy to just hit the snooze button if your alarm clock's within easy reach. Just put it far from the bed and force yourself out of bed to switch it off, and then try going to the bathroom immediately. You'll be less motivated to go back to bed. Every 3-4 days, go to bed 15 minutes earlier than you did before, then get up 15 minutes earlier the next morning. Make sure you keep this routine at weekends. Soon, you'll be able to go to sleep and wake up when you want. Some apps can help you sleep without thoughts running through your head. The Sleep Pillow app plays gentle ambient sounds that help you rid of those thoughts and guide you towards sleep. Another app, Sleep Cycle, cleverly uses your smartphone to monitor your movement in bed, finally waking you up when you're in your lightest phase of sleep. 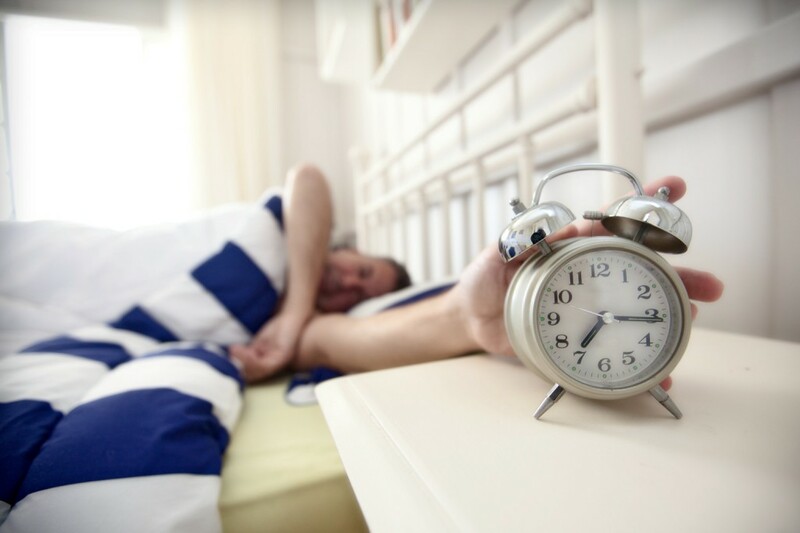 Why not give yourself a financial incentive to get up earlier? Pledge sites enable you to commit to getting up at a certain hour, and encourage others to join you. Whenever you break this pledge, you donate a small amount of money to charity. Other pledges you could make to help with sleep include exercising every day, cutting back on evening screen time, or reducing the amount of alcohol you drink. A Wake-Up Light emulates sunrise by slowly getting brighter. Many coffee machines have programmable timers. So when your alarm clock does wake you up, you'll also be greeted with a mug of fresh hot coffee. Take advantage of the online social network to wake up yourself. For example, you could promise your followers a tweet or status update at sunrise. This could be a simple message, such as "Good morning everybody" or alternatively a picture of the sunrise. Your social network is awaiting your first message every day, a great motivation, right? Sunlight is perfect solution. Our circadian clocks are programmed to respond to natural sunlight. Thus, just set your alarm, then get up and go outside to have breakfast or a quick walk. You can also try keeping your curtains/blinds open at night so light floods into your room in the morning as sun rises. Blue light from phones, tablets, televisions and computer screens stimulates the brain, making it harder to fall asleep. Although it's difficult in today's connected world, try to cut back on your screen time. It's recommended to turn off any electronic media two hours before hitting the sheets. Prior to going to bed, try taking 0.5-1 mg melatonin. This hormone, produced naturally in the body, helps reset your circadian clock so that you can sleep when you want to. Look for advice or consult a sleep specialist as to the best time to take the melatonin. Some may have difficulties sleeping when worrying a lot for the next working day, making you can't wake up in the morning. Then, you can just do something to prepare for the next day. Facing a big decision the next day, it may help to write down a plan of action for dealing with this before you go to bed. Also, try using a to-do list app (any.do or Todolist) or use an old-fashioned notebook to jot down your thoughts and worries. Make a note of one exciting thing to do the next day, like a new exercise routine, a work project, meeting a friend, or trying a fresh activity. This will give you plenty of motivation to get out of bed.